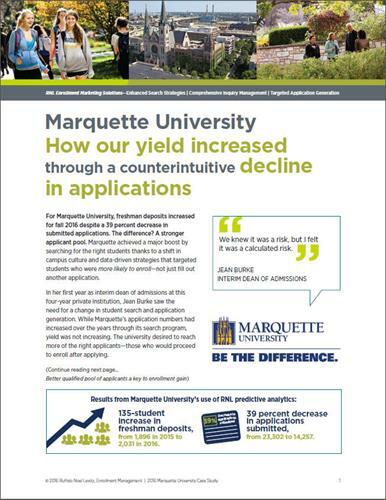 Marquette’s application numbers had increased over the years through its search program but its yield was not increasing. In its quest to find more of the right students, the university wanted to build a more qualified applicant pool more likely to enroll after applying. Download the full story below. An increase of 163 freshmen despite a 39 percent decrease in submitted applications exceeded the university’s goals. Three programs hit their maximum enrollment limit, and the proportion of applicants committed to Marquette grew while maintaining the quality and characteristics of the freshman class. See how RNL Applicant Cultivator can help you target the right applicants to meet your enrollment goals.